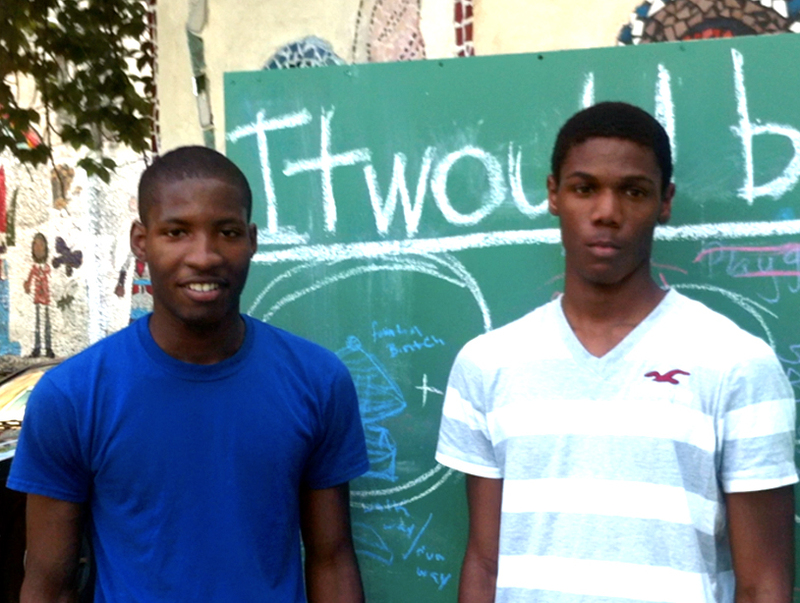 Three hours of design-building and rapid prototyping structures on vacant lots in North Philadelphia was all it took to inspire two #teendesignheroes from Philadelphia to want to start a larger movement of community generated DIY neighborhood improvements. Needless to say, I am blown away by the energy, ideas, and conviction of Paul, RJ and the other #teendesignheroes at The Village For Arts And Humanities. Yes, building and ‘doing’ are incredibly transformative tools, and given that these tools are central to how I work, I’ve seen similar reactions before–from places as diverse as the Sunshine School in rural Alabama to our #teendesignheroes camp for Chicago teenagers at Frank Lloyd Wright’s Taliesin–but three hours is a new course record folks. Why such an immediate reaction? Paul and RJ are certainly great, thoughtful guys but there is nothing in their backgrounds that would make them uniquely disposed to wanting to inspire others in Philadelphia to re-design and improve their neighborhoods. Other #teendesignheroes such as Diana have talked at length about the incredible sense of empowerment that our unique design-building methodology–which doesn’t require specific architectural knowledge to make something wonderful–imparts on them. I think that the methods definitely had a big impact on Paul and RJ’s outlook but there is one other unaccounted for factor– feedback. Working on a relatively heavily trafficked corner in North Philadelphia meant that we were getting immediate feedback from passersby and community members. Paul and RJ didn’t have to wait to hear about the impact of their actions, they got to see and hear people’s reactions to their work in real time. Indeed, in this rough, post-event video they recount their amazement at the responses from passersby, especially the father who stopped and let his little girl build. 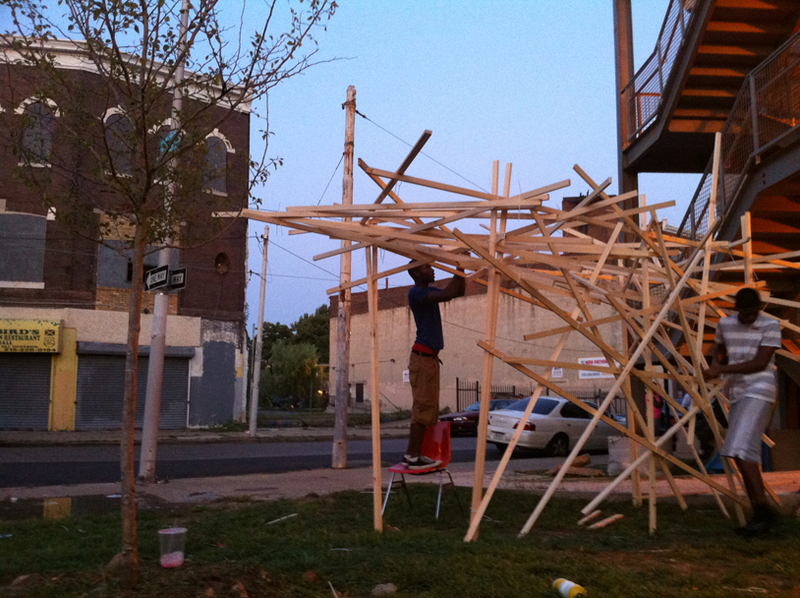 What if we create a corps of Philadelphia #teendesignheroes who design and build improvements in the public spaces, vacant lots and schools in their neighborhoods throughout the City? 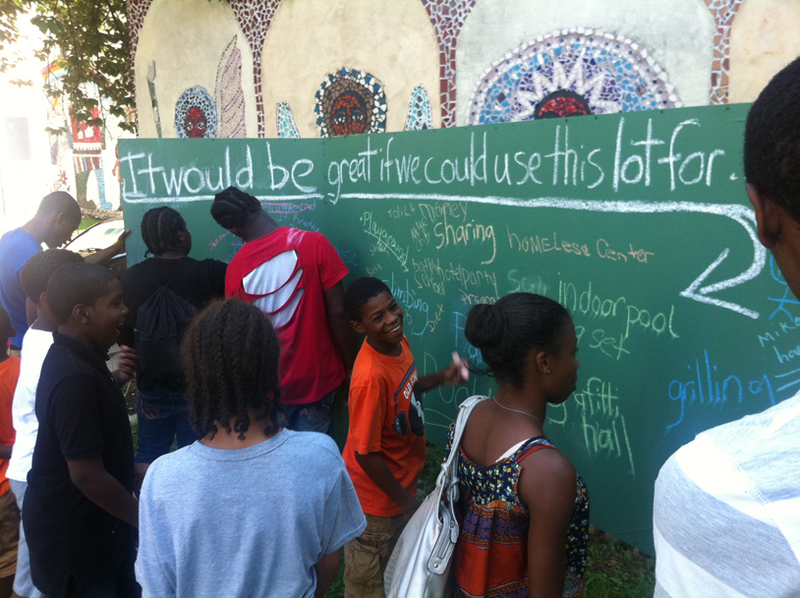 Why shouldn’t we create a corps of #teendesignheroes who not only take the lead on designing and building the bus stops, benches, shade structures, playground equipment, and planters that Philadelphia so desperately needs, but in the process, inspire a much larger city-wide movement of neighborhood self-improvement? Last week I spoke in San Francisco at SOCAP (an international conference on social entrepreneurship) on the importance of prototyping new behaviors that enable people to solve our cities’ most pressing challenges. When we think of disruptive technologies we overlook youth, most immediately imagining such things as iPhones or the combustible engine. However, youth are incredibly powerful as a disruptive technology, modeling behaviors and approaches that either adults have forgotten or didn’t think was possible, and I have seen this time and time again in my work. The students at the Sunshine School decided to improve the condition of their school when nobody else would, breaking through their teachers’ immobility and frustration with the school district. My 19 year old superstar former intern Brenda, helped model how youth and community could be uniquely incorporated into a Chicago architecture firm’s design practice to help it create better buildings and better neighborhoods- creating an unprecedented business model. And of course there is the 24 year old at the National Building Museum who decided to build something even more impressive out of Legos because she saw a five year old make something wonderful. If all of this is true, give me one good reason why shouldn’t we put Philadelphia youth at the forefront of designing, building and improving Philadelphia? And I haven’t even begun to describe the incredibly positive impact this can have on #teendesignheroes academic achievement, sense of empowerment and self-worth…….. Incredible thanks to the Slought Foundation, The Village For Arts and Humanities and the Dennis Oppenheim Studio for making these workshops possible.